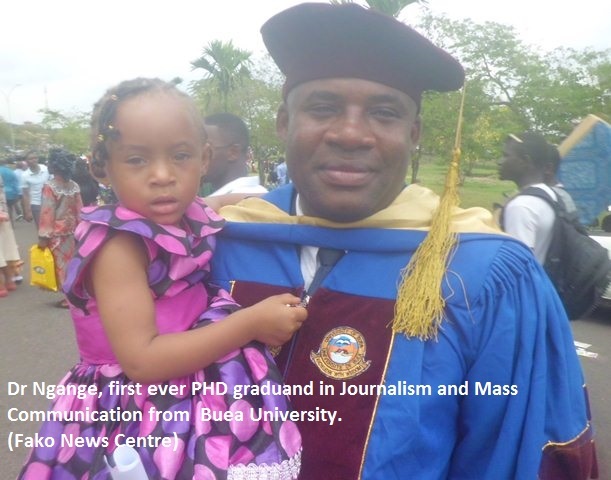 The University of Buea, Cameroon, has produced its best ever GPA student and the first ever PhD in Journalism and Mass Communication from a university in Cameroon. 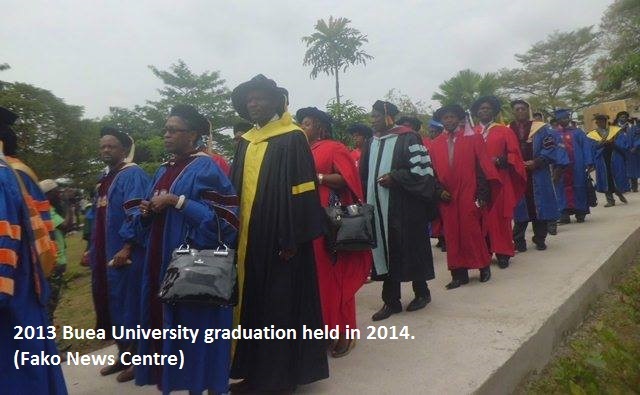 This graduation ceremony witnessed a female undergraduate student, Njantan Njachen Ursulla Dulvine, graduating with a 3.93 GPA in Biochemistry and another student, Ngange Lyonga Kingsley graduating with First Class Honours PhD in Journalism and Mass Communication. Three years ago, Njantan Njachen Ursulla had excellent GCE Advanced level results where she passed in five subjects with grades 4A and 1C in Biology-A, Chemistry-A, Maths-A, Further Maths-A and Physics-C. It would not surprise any body that a student with such excellent GCE results would go on to have the best average in university. 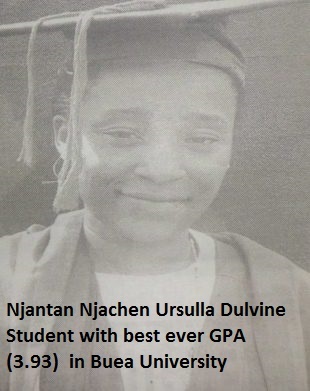 While Njantan Njachen Ursulla Dulvine makes news graduating with the highest GPA (3.93) ever recorded in the history of the University of Buea, Dr Ngange, native of Bakweri, also enters the record books of the university as the first to ever defend a PhD in Journalism and Mass Communication since the University of Buea was created in 1993. 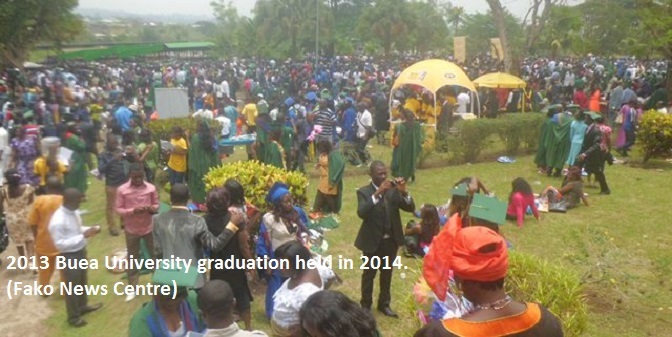 Dr Ngange is also the first to have defended a PhD in Journalism and Mass Communication from any Cameroon University. Ngange Lyonga Kingsley is a lecturer in the same department he graduates from. He has worked with the Cameroon Radio and Television Corporation (CRTV) and earlier at the Public Relations and Alumni Office of the University of Buea. He is currently the Faculty Officer of the Faculty of Social and Management Science, University of Buea. 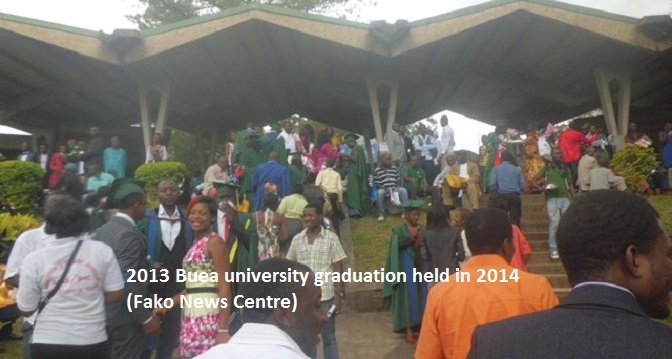 Relatives and friends of granduands swarmed the university campus to celebrate with and see their loved ones being awarded degrees and certificates. Business persons also took strategic positions on campus to display and market their goods and services. The end of certificate awards was followed by dining, drinking and dancing back at family homes of the graduates.